Joining the USS Future Imperfect is easy! Fill out the form on the Join Us page, and we’ll reply to you shortly and you can join through the SFI Member Database. STARFLEET membership is optional, and not a requirement for ‘Future Imperfect‘ membership. However, only paid members of STARFLEET have voting privileges for Future Imperfect and STARFLEET business, able to gain rank, and be eligible to serve as a Senior Officer. We host frequent social media, gaming, and podcast activities other seasonal events. We also have an online mailing list and conduct online meetings and chats. All our events are family-friendly. The USS Future Imperfect is but one chapter in STARFLEET’s Region 13, an area covering Michigan and the Canadian Provinces of Ontario, Manitoba and Nunavut. Dinners, picnics, camping, festival outings, and Summits (business meetings) are but a few of the activities we do on the Regional level. Our parent organization is STARFLEET, The International Star Trek Fan Association Inc. It is the oldest fan-run organization in the world, with over 4,000 members worldwide. Because of the scope of the STARFLEET being an international organization, most of the activities at this level are conducted online. Email mailing lists, online chats are a few of the many ways members can interact. Each year, STARFLEET hosts the International Conference in a different location. The IC is the annual business meeting, but there are a lot of fun activities that also go on for those just wanting to connect to other members and have fun. A big perk of your STARFLEET membership, is STARFLEET Academy. SFA is a special collection of correspondence courses that span all aspects of Star Trek and other science fiction. Some courses even cover non-sci-fi real world topics. Each ‘college’ offers dozens of different courses at varying levels of challenge from super-easy to really hard. In total, there are nearly 1,000 different courses available. Please note: while you don’t have to be a STARFLEET member to be on the USS Sinclair, you do need to be one in order to take STARFLEET Academy courses. For over 40 years, STARFLEET has provided Star Trek fans a way to meet each other, make friends, have fun, give back to their communities, and show that the dream of Gene Roddenberry can live long and prosper. On the local level, members can gather with other fans for a variety of enjoyable activities. On the international level, STARFLEET offers our members a wealth of resources that you won’t find in any other Star Trek fan clubs. In addition to a great set of membership materials and our regularly-electronic newsletter, STARFLEET offers members the chance to get involved with STARFLEET Academy, the STARFLEET Marine Corps, STARFLEET Special Operations, STARFLEET Medical, Pet Fleet, and much, much more. We even have a group of academic monetary scholarships that are awarded to deserving STARFLEET members each year. 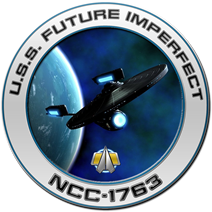 Like most other STARFLEET chapters, the USS Future Imperfect members hold positions ranks and as such promotions are granted based on a points system which demonstrates how a member is active in the chapter, Region, Fleet, and in their own community. Members of the USS Future Imperfect may be as active or inactive as they choose. If a member only wants to sit back and read the newsletter, that’s fine. If a member wants to get involved there are many ways to do so: writing for the USS Future Imperfect, Regional, and FLEET publications; artwork for these publications; writing letters; working on projects such as ship’s blueprints, care packages to deployed soldiers, recruiting; recycling programs, building models; or anything you can think of that your Department Chief, First Officer, and Captain approve. I hope you enjoy your tour of the USS Future Imperfect.